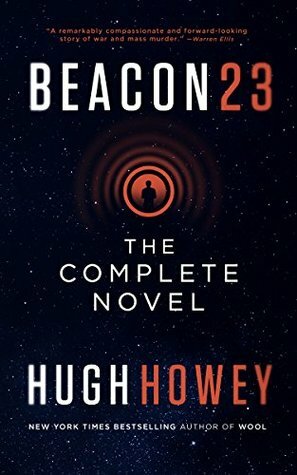 Beacon 23 by Hugh Howey is a story about a lighthouse keeper and his lighthouse, but with a futuristic twist. In the 23rd century, lighthouses have moved into outer space, and allow spacecraft a safe means of travelling faster than the speed of light by providing navigational information as they journey throughout the Milky Way. Beacon 23 is one such lighthouse, packed full of technology to ensure the safe transit of passing spacecraft. The technology is designed to be super reliable, has multiple built in redundancy systems and should never break down. Lighthouses are manned by a single keeper, whose job it is to track down any glitches in the system and to report back to NASA when anything untoward happens. The keeper of Beacon 23 is a decorated army veteran, invalided out of the army after suffering near fatal injuries during his last tour of duty. After leaving the army he requests to be posted somewhere he can be alone, far away from the war where his demons exist. So, he now finds himself on his second tour as keeper of Beacon 23. Being alone in space, light years from anywhere or anyone brings a special sort of solitude. There are dark thoughts, feelings of claustrophobia, imprisonment, with lots of time to reflect on past actions, and the distinct possibility of an eventual descent into madness. The war, which was once far away, is creeping closer, escalating to new levels, expanding to the outer reaches of the galaxy. There seems to be no end in sight, and with millions of lives already sacrificed by both sides, there may be no possibility of a peaceful resolution. Does the lone lighthouse keeper hold the key to ending it all? Should he confront his demons and make a pact with the devil? Or has the madness finally consumed him? I really wanted to like Beacon 23. It has many good ideas, a sympathetic main character, some interesting technology and has plenty of things to say about solitude, war and futility. However, probably because the story was told in the first person, I couldn't help myself from making comparisons with The Martian - one of my all time favourite books. The books are quite similar in many ways although completely different at the same time! On the whole I enjoyed the story but there was something wrong that I couldn't quite put my finger on. Maybe it was because there were a couple of flaws in the plot that I couldn’t get my brain to accept, or that the ending seemed to be very neatly contrived. Maybe it was the love story that played away in the second part of the book that seemed to happen out of the blue, and escalated very quickly! Whatever it was, it didn’t spoil my enjoyment, but it did put a niggle in the back of my mind that I couldn’t quite shake. Beacon 23 is a fairly short novel, and considering it deals with solitude, regret, PTSD, insanity, war, love, peace and forgiveness it packs a lot into a short space. It does all of this at a good pace and with occasional bouts of humour. You know, now that I’ve written that last paragraph, I think I know what the niggle is in the back of my mind. I don’t think Beacon 23 is a science fiction novel! While it’s true that the events take place in outer space, they could just of easily have taken place on Earth, in a normal lighthouse. I’m not sure whether that is a valid criticism, but it definitely niggles me.